Efficiently exchange data between your FileMaker Pro solution and Microsoft Outlook, Exchange or Office 365. 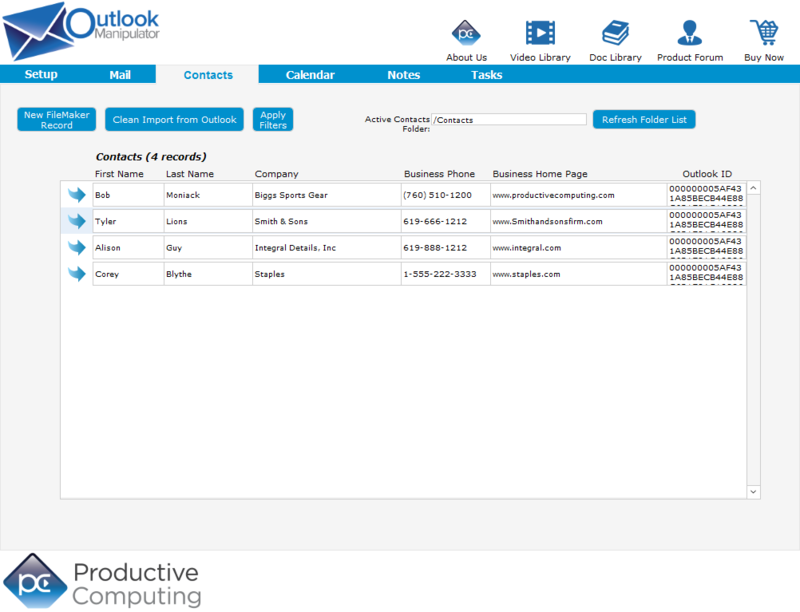 Centralize your entire company’s contact list by using this powerful plug-in to pull Outlook contacts from each user into FileMaker. 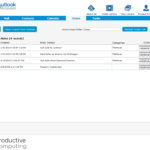 Integrate your FileMaker solution with Microsoft Outlook and Exchange. 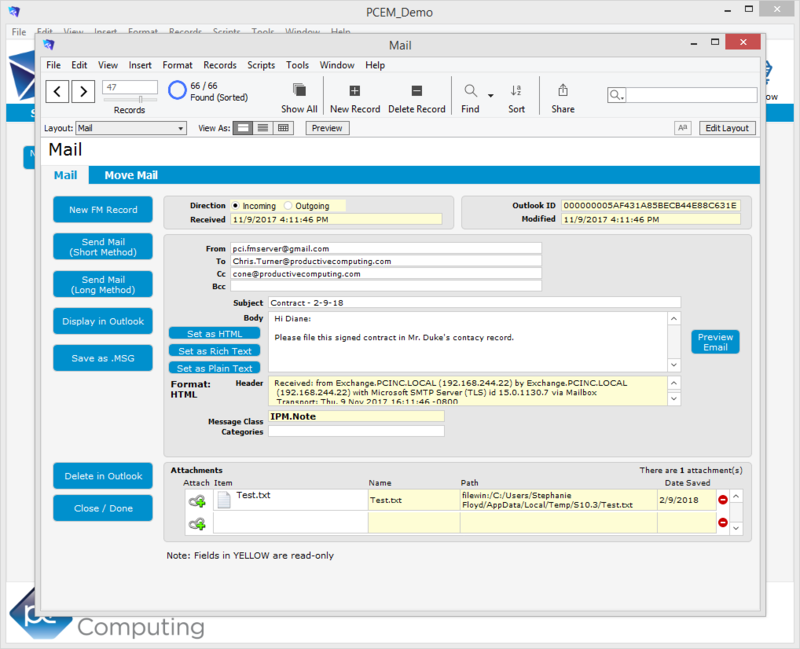 With this powerful plug-in, you can push and pull Contacts, Calendar, Tasks, Mail and Note records between FileMaker and any user’s default folder, public and shared folders within an Exchange Environment or with any Exchange mailbox. 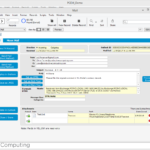 The plug-in installs within FileMaker and communicates directly to the user’s Outlook application running on Windows. All functions are completely scriptable by the developer for a near limitless list of possibilities to provide either a simple or elaborate integration. If you are using Microsoft Hosted Exchange or 365 in a server environment, have a look at the Exchange Manipulator plug-in. 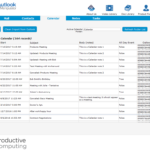 Learn how to integrate FileMaker and Microsoft Outlook using the Outlook Manipulator plug-in with Productive Computing University’s new course Connect FileMaker to Outlook. With this course, you will learn the skills necessary to build a robust solution with a direct connection between FileMaker and Outlook. This plug-in is verified compatible with FileMaker Pro 15-17 and Windows® 7/8/10 and may work with earlier versions. Added support to allow accepting of meeting requests using a new parameter "ApptResponse" in the "PCEM_SaveRecord" function. Resolved issue when getting the "HTML Body" field of an HTML email message with a large body size. 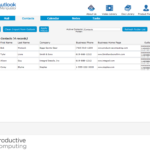 Outlook Manipulator is verified compatible with FileMaker Pro 10-13 and may work with earlier versions of FileMaker Pro. Fixed a PCEM_Authenticate error with Outlook 2013. Updated scripting for "Apply Filter"
Updated the pulling of information from "group" contacts. Updated emails "Set at HTML"
The PCEM_GetAttachmentName function has been changed back to return the FULL attachment name rather than the truncated attachment name. Added an optional "OptTruncated" parameter to the PCEM_GetAttachmentName( Index ; OptTruncated ) function to allow the truncated attachment name to be returned if desired. Added new PCEM_OpenSavedItem( strPath ) function. This function opens an item saved to a local drive in Outlook. 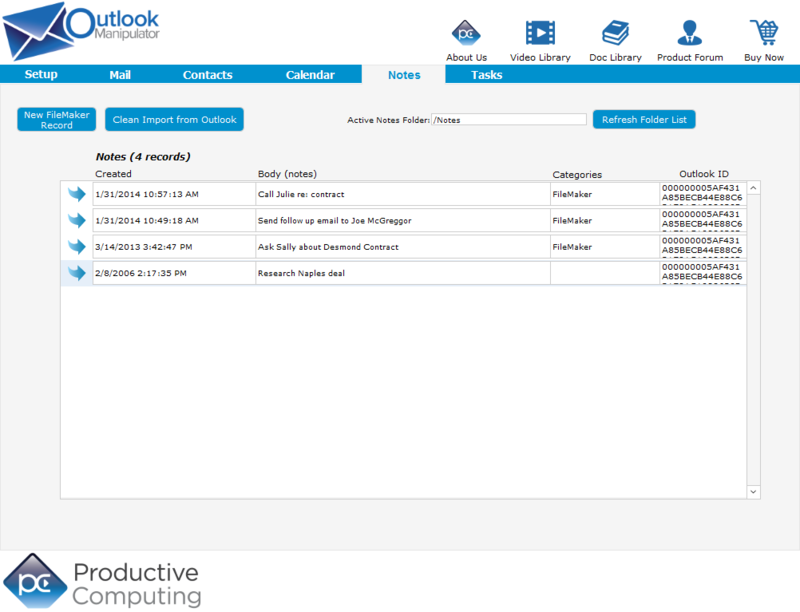 Added a new PCEM_OutlookVersion function to check which version of Outlook is installed. Added new PCEM_OpenSavedItem( strPath ) function to open the MSG files on your hard drive. This function corresponds with the existing PCEM_SaveRecordAsMsg function. Added a new PCEM_GetAttachmentSize function to obtain the file size of an email attachment imported into FileMaker. Fixed error that was returned when the PCEM_SetFieldData( ?Required Attendees? ; SomeValue ) or PCEM_SetFieldData( ?Optional Attendees? ; SomeValue ) was successfully set. An error is now returned when an invalid file path format is passed such as a file path with forward slashes "/" etc. For example, the FileMaker file path format is different than the Windows file path format. Our plug-in currently takes the Windows path format. Fixed issue when the PCEM_ CreateCustomField function returned an error "Item operation called without opening/creating a record? when calling this function after the PCEM_NewRecord function. PCEM_ CreateCustomField adds a custom field to the currently opened record. Since a new record is not an opened record, we received this error. This issue has been corrected and the custom field is created in new or open records without receiving an error. Added support back for Outlook 2010. Support was inadvertently taken out of version 5.0.0.5. Added enhanced error trapping to GetAttachmentName and SaveAttachment. Restructured GetAttachmentName to avoid unsupported characters. Attachment name now returns 8 character file name with the file extension. PCEM_GetLastError function was not reporting last error strings properly. Added support for Outlook 2010. This new version is a paid upgrade offered at a 35% off upgrade price. Added error logging to the plug-in. Internal iterations made to the plug-in and minor bug fixes. Fixed errors when sending meeting request by setting "Appointment" literal string in the PCEM_SaveRecord function. Fixed retrieving HTML formatted email body as version 4.0.1.4 had bug when returning the HTML body. Fixed Errors when sending meeting cancellation requests. Previous versions would send updates and not cancellations. Added optional parameter to PCEM_SaveRecord - "keep open" as the parameter causes the current to remain in memory instead of releasing it. Added extra fields to appointment when sending as a meeting request. 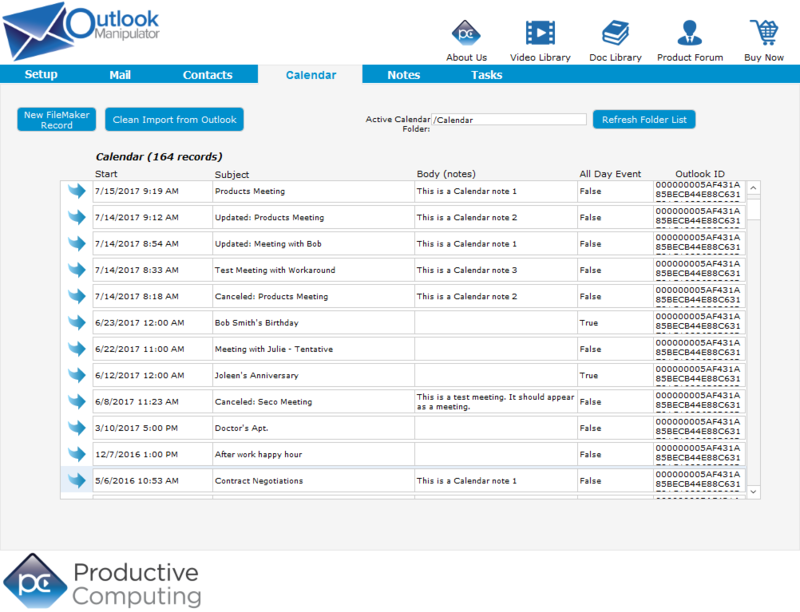 The extra fields allow for outlook to properly manage Attendee updates. Fixed DeleteAllRecords bug. Properly deletes records and reports errors if any or 0 for success. Fixed issue were PCEM_FilterByLastModified function was not properly filtering the contents of the current folder. Version: 4.0.0.9 | Release Date: 08/24/2009 | Platform: Win- Corrected registration issue where the plug-in was expiring in 30 days for all users. The redemption is no longer required! Plug-in works in cached mode as well as non-cached mode. Outlook Manipulator and Exchange Client Manip functionality have been combined into one plug-in now known as the Outlook Manipulator. 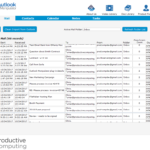 Outlook Manipulator is a SaaS (software as a service) product and requires an active subscription. A credit card will be kept on file for automatic renewal. At the time of renewal, we will send you a receipt so that you know your card has been charged. The subscription is required for use of the product and to keep the registration code active. The plug-in bit version that you use depends upon your FileMaker Pro bit version and the bit version of Microsoft Outlook. All applications need to be running in the same bit version. Note: 32-bit applications and 32-bit plug-ins will work on a 64-bit operating system. The Outlook Manipulator Mac Template is for development purposes only. For full functionality to communicate directly with Outlook for Windows the full version of the Outlook Manipulator plug-in is required. Unfortunately, communication of any kind to the Macintosh version of Outlook is not available.